To celebrate Nuffield Health partnership with the Tour de France Fan Parks, Nuffield Health are giving you the opportunity to design and win your very own piece of le Tour. Nuffield Health teamed up with the Tour de France Fan Parks to bring you the chance to win a truly unique prize of a personalised cycling jersey which can be created using our exclusive Design Your Own Cycling Jersey App. Five lucky winners will receive their personalised jersey while we will be giving away lots more great prizes each week including exclusive Nuffield Health cycling Jerseys, free memberships, water bottles, plus many more… Every entry will receive a free gym pass to one of our Fitness and Wellbeing Centres available across the country. If you share the style and swagger of Sir Bradley, click the let’s get started button here or head over to the Nuffield Health Facebook page to start building your own personalised cycling jersey. Follow our simple steps below on how to enter: STEP 1: Click the get started button and choose one of eight designs to create and personalise your own jersey. 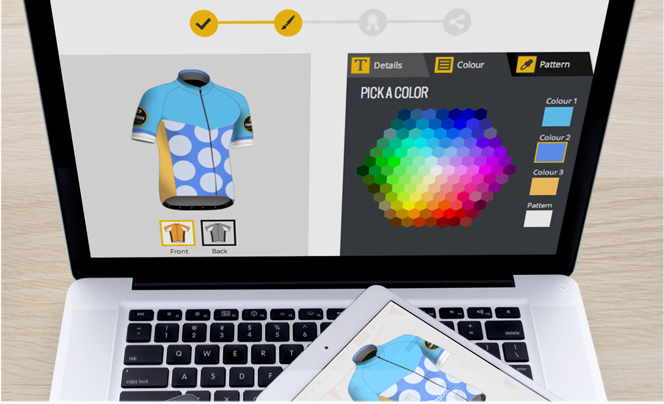 STEP 2: Edit the details, colours and pattern to replicate a tour classic or create a completely customised jersey. STEP 3: Submit a design and share it with your friends on Facebook, Twitter, Pinterest or via email. Check out our case studies to view the whole case studies and other related work. For any enquiries regarding this campaign or similar please contact davidluca@finervision.com.